– (incisiveness). In what follows, this category is applied to a small fragment of a literary text: an expression or a single sentence. Though “aptness” (of expression) indicates a perhaps rather elusive, but relatively uncomplicated property of linguistic organization of a small fragment of a literary text, this essay deals with a broader problem, less specific, for which this term has been chosen “for lack of a better one” – its meaning comes closest to the range of poetological phenomena to be discussed here, although its dictionary definition does not encapsulate all aspects of the problem in an obvious way. The point of departure here is in fact a theoretical intuition, difficult to define straightforwardly, relating to an aesthetic experience probably familiar to every reader, involving a kind of rapture at a small fragment in a literary work (often a single sentence). The object of this feeling can consist of a number of aspects of the work. Because this kind of stimulation can be defined as an emotional form of the most favorable possible evaluation of a literary work, in order to define the possible objects of this fascination (and thus: to define “how” the relevant expression is apt), it may help to refer to the typology of ways of grasping the essence of a literary work developed by Michał Głowiński in the book Ekspresja i empatia (Expression and Empathy). However, given that the passage in question concerns Głowiński’s theory of literary criticism, applying his proposed concepts to a discussion of the problem of aptness and related fascination demands some manoeuvres of adaptation. The first of the methods for the critical grasp of a literary work is defined as a formal modelling approach and involves verifying the suitability of individual features of the work to principles, recognized by the critic as normative, of literary construction. In the context of aptness, fascination with a given expression due to its formal modelling properties would mean that it inscribes itself into a particular reader’s structural, aesthetic or compositional expectations. At the same time, that does not necessarily mean that there exist any objective rules of correct generation of literary utterances or that an utterance that so moves a reader will unfailingly fulfill such rules. The concept of “expectations” should be understood to mean simply the model of the text that is closest to the subjective preferences of the text’s receiver. In order to demonstrate aptness understood in this fashion, there is no need to invoke any extratextual criteria. The reader can either evaluate the construction of the passage itself, its prosody, the optimal (in his opinion) ordering of the words that compose it or properly chosen stylistic means, or he can judge the passage to be apt in relation to the structure of the entire literary work to which it belongs. In the second case, the work is found to generate via its own structure a certain universe, autonomous with regard to the external world, governed by laws that are binding only within itself. In this formulation, an apt expression is one that manages in an unusual way to synthetically capture the essence of that universe; it may in some sense call that universe into being (in which case it constitutes the aesthetic organization of the text) or crucially modify it (if by means of its appearance, it significantly changes the functions of other elements in the work; we must note that it does this in such a way that it endows those elements with new, valuable artistic qualities). The second approach, the mimetic one, on the other hand, places the accent primarily on the relationship of the text to the external world. A critic who undertakes his reading with this scholarly orientation judges the way that particular elements of reality are depicted within the represented world of the literary work. He can then evaluate those depictions, either in the spirit of realism, in terms of the plastic fidelity of textual objects to extratextual originals, or according to another concept of mimesis, for example in terms of the text’s capacity to capture the essence (idea) of a given object or (natural, social, political, or other) phenomenon. The range of interests of the critic studying the work from such a perspective can also include an analysis of the layer comprised of the events occurring in the work and their assessment according to the criterion of verisimilitude, of adherence to certain rules of probability. A reader oriented toward the mimetic reception of literature can find a given expression to be apt when the text presents a way of seeing and knowing the world that resonates closely with him. An apt expression then performs such a selection of elements from reality or attributes of a particular object that in the reader’s reception, it offers the closest possible approximation to reflecting the real world or the condition of the thing being described. The reader thus captivated by an apt expression feels a kind of “community of perception” with the text; he or she is satisfied that the image of reality to a great extent adheres to his own personal views concerning the real world. Here, however, we should point out that we are not talking about the kind of agreement that can easily develop when, for example, reading a journalistic text (that would mean the belief in the rightness of certain opinions contained in a literary work), but rather the affirmation of the way of cognizing reality presented in the work. The reader then either asserts that his perception of the world is governed by the same mechanisms as those that are operative in the literary work, or has allowed himself to be astonished by the possibilities presented in the text for giving an account of reality; he perceives in it the signs of a specific sensibility which he assesses as close to his own and begins to desire to learn to see the world in the same way. The third and last way of grasping literature defined by Głowiński is the expressive approach. This approach assumes that the literary text is a form of communication sent to the reader from the author, by means of which he externalizes his views and feelings. In this formulation, there can be no recognition of the work of literature’s autonomy vis-a-vis the extraliterary reality; what is more – in this perspective (and, it would appear, only in it) there can even be an attempt to undermine the status of the work as a form of fiction. In order to fit this conceptualization to the problem of aptness, it is necessary to make a significantly more radical departure from Głowiński’s concept than we have done in the two previous cases. For him, the essence of the expressive understanding involves isolating the tools that enable criticism to enter into the emotional state of the author of the work being analyzed and thus reach the hidden depths of his work. In order to show the third possible way in which a given expression may be apt, it will suffice simply to borrow a small, very general aspect of this broad notion: the literary work is here the utterance of a subject, and hence, an aggregate of definite views on the topic of reality. If these three motives for finding an expression to be apt were to be transformed into some kind of classification of the types of aptness, the one derived from an expressive model of literature would have to be termed philosophical. In this conceptualization, aptness signifies the approach of a given expression to some kind of general Truth, understood metaphysically and essentialistically. The search for an apt expression in this case means a search for apt opinions or observations. They may relate to the problems of human nature, interpersonal relations, or moral, psychological, historical, and historiosophical issues, for instance. If the reader is overcome by delight at a formulation which is apt in this sense, it means that he has drawn some sort of lesson from it; together with the appearance of that formulation, the work revealed to him a truth, previously unknown to him, about the world. There have thus emerged three ways of defining the criteria according to which a given expression can be considered apt. It should be added that in a particular case, an expression may merge two of these forms or even all three of them, or it may fulfil them only partially, modify or simplify them, or complicate them still further. This schematization is meant to be a useful instrument; the main point is not to create a thorough classification of the different types of aptness. This introductory section had the purpose of concentrating the fleeting associations that might be elicited by the phrase “aptness of expression,” so that we can now proceed unhindered to the fundamental problem of this essay, i.e., the question: is aptness conditioned by features of the text, or of its reception as well? The problem of aptness, though called by many names, has belonged to the range of interests of every attempt to reflect on the subject of ordered utterances, including literary ones. Aristotle, in the third book of his Rhetoric, writes of “excellence” in language, observing that in order for an utterance to be capable of achieving the effect of persuasion, it must not only deliver content of relevance to the listener, but also be marked by certain stylistic values. To obtain the desired effect, the rhetor can use a variety of means, among which the philosopher places particular emphasis on metaphor, contrast and compositional procedures aiming at endowing the style with the stamp of “vividness.” In his Poetics, however, he instructs that to achieve high artistic value the poet must search for expressions that are rare and refined, attempting at the same time to astonish the reader (viewer, listener, audience) with the means by which the literary utterance is organized. The chapter on features of poetic style is particularly interesting from this perspective; in it, Aristotle shows how Euripides’s substitution of just one word for another in a line taken from Aeschylus significantly modifies the line’s aesthetic properties. It appears that the poetics of the concept took form in the sixteenth century based on similar premises, which are naturally linked with the category of aptness. According to the Słownik literatury staropolskiej (Dictionary of Old Polish Literature), a prominent place in the conceptual system of conceptism is accorded to the rhetorical terms acutum and argutum, which represent “the disposition toward what are called sharp and well-aimed or witty thoughts (acumina) and the effects achieved through those by the work itself both in its range of thematic formulations and its dialectical devices and stylistic ornamentation.” The purpose of the concept was to surprise the reader through a deliberate complication of the linguistic level of the text, thereby forcing him to exert an intellectual effort, by which means the work attracted the reader’s close attention. The ways of attaining this effect were quite clearly and precisely defined; in the words of the Słownik, “the highest rank in the theory and practice in this area was earned by […] metaphors based on the juxtaposition of distant concepts, and figures or tropes that elicit shock or surprise.” There follow concrete examples of the most frequently used stylistic means, such as antithesis, oxymorons, ellipsis, and inversions. 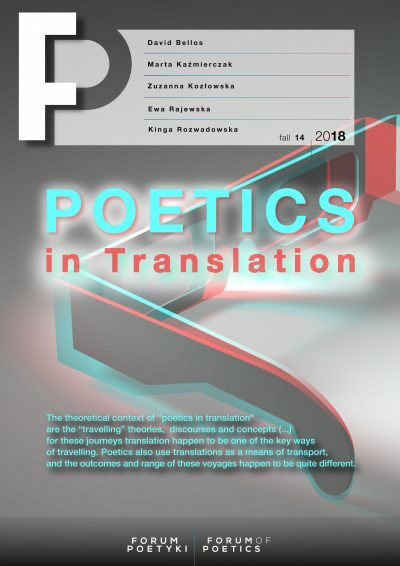 Setting literature the task of eliciting such reactions as shock, astonishment or surprise directs us toward the most important theses of Russian formalism, in particular to the theoretical concept constitutive for that school, the literary device. At the centre of the Formalists’ preoccupations lay the problem of the autonomy of the literary work, and thus they were interested in the ways that a work establishes differences between fiction and reality. Various operations that aim to render the text strange serve the purpose of establishing such differences. Their repertoire includes all of the methods shown by Aristotle and the theorists of conceptism, but is not limited to those. Anything that serves to construct an ingenious linguistic game can be called a literary device; anything that defines the distinguishing features of literariness, and thus everything that makes form, language, and the method of a work’s construction the main “hero” of the text. The Formalists thus placed a particular accent on the appropriate choice of linguistic means and linguistic virtuosity, programmatically ignoring the aspects of works’ content, the properties of particular elements of the represented world, the structure of the characters’ psychology, and so on. Boris Eikhenbaum, in his famous analysis of Gogol’s “Шинель” (The Overcoat), writes frankly that the awful narrative of the government clerk presented in the short story has no intrinsic interest. Only the tension that arises between the comic linguistic devices and Akaky Akakievich’s tragic fate generates the desired grotesque effect. Eikhenbaum limits his work to an analysis of the linguistic layer of the text; according to the premises of the school he represents, that is completely adequate for grasping the essence of the work. The theories presented above thus offer a few tools that enable efforts to determine what the properties of an expression or phrase are that we consider apt. They may turn out to be particularly helpful in an analysis of some truly well-known sentences, widely considered to embody mastery and which for that reason have gone down in literary history. When the number of readers who are agreed that a given expression is apt becomes truly enormous, aptness takes on the marks of objectivity. If someone were trying to scientifically prove that objectivity, that person would have to resort to methods similar to those presented above. Very often, however, a sentence intended to enchant is not found enchanting at all, or, on the contrary, a sentence which appears to be undistinguished in every way elicits very strong emotions in a reader, with the effect that it remains in his memory a long time, and the work in which it is contained begins to be perceived by him as constituting an increasingly large percent of the overall wealth of his reading. There is a whole group of entirely subjective and irrational reactions linked with the category of aptness, which for that reason, cannot be subjected to such precise description as the aspects of the problem mentioned above, and yet together comprise one of the most important, and certainly one of the most intimate reading experiences. In truth nobody turns, while reading, or as a theatre spectator, to their own conscious experiences, nor do they reflect on their own psychological states. If we suggested to anybody that they do so, they would no doubt have a laugh at our expense. Only a theorizing literary scholar could come up with such a bizarre idea as looking for a work of literature in the ‘soul’ of the reader. The aesthetic properties of the literary work are, according to Ingarden, deeply rooted in the work itself, and cannot be separated from it. They are objective and determine the importance of the work, and the capacity to perceive them is what determines the reader’s competencies (though understood not so much in terms of intellectual ability as in categories of a certain kind of sensitivity), but not the worth of the work itself. The ideal way to full knowledge of a literary work is an encounter with an aesthetic experience, understood, however, not as simply being moved by reading the work but as an unusually complex and long process (in his O poznawaniu dzieła literackiego [On Knowing the Literary Work] Ingarden lists the seven stages of its formation), at the end of which all of the work’s properties and qualities reveal themselves to the reader in a kind of illumination. The philosopher, however, also perceives in this process that quality that is the object of this study, but treats it as merely a necessary point of departure toward more important phenomena. The aesthetic experience, according to Ingarden, begins with the reader’s turning his attention toward some particular element of the literary work that elicits very strong emotions in him. These emotions are so strong that they become a kind of object of desire for the reader, as a result of which he begins to desire the closest possible contact with the work, in order to have his fill of it. In this way, that introductory emotion, as Ingarden calls it, opens up the possibility of progressing to further stages of the aesthetic experience and that, according to him, should be its one function. The philosopher is aware of the fact that this first stage is often linked with an experience of tremendous pleasure, and that is why he warns against identifying it as the entirety of the aesthetic experience, that complicated “harmony of aesthetically lofty qualities.” Focusing on the intimate, subjective feelings that accompany the reader while reading is considered useless, and even harmful to the work itself. Often such emotions are only superficially linked with the reception of the work; they are influenced by the presence of factors external to it, such as the reader’s individual experiences, views, or the mood he is in at a given moment. These reservations are in large measure correct, since it is true that if we assume that a work is marked by certain objective properties, that it contains some essential truth about itself, an analysis of the fortuitous feelings that may accompany a chance reader during his engagement with the work cannot bring us any closer to discovering that truth. Still, the process described by Ingarden represents a model and, one might say, a laboratory one; to undergo the full aesthetic experience is, for various reasons, not always possible, and what is more, the philosopher himself notes that in the first place, not every work has the potential to elicit that experience in readers, and in the second place, that not every reader is capable of having that experience. The experience of being enchanted by a short passage in a literary work, on the other hand, is a fairly universal one, and though it cannot be formulated in a cohesive methodological framework, we cannot rule out its exertion of a significant influence on the formation of intersubjective imaginings about literature as such. For that reason, the phenomenon of aptness of expression or the imputation of aptness of expression by the reader seems at least worth attempting to describe, even if a “theorizing scholar of literature” thereby subjects himself to the risk of ridicule. A critical period that advanced several helpful guidelines for attempting to grasp the formula of aptness was, we can now see, the 1970s. Three works appeared in that decade, quite independently of each other, which lend themselves to use in describing the individual and subjective experiences felt by readers in their encounter with the text. In 1973 Roland Barthes published his most famous, book-length essay, The Pleasure of the Text, a kind of intimate journal of his experiences as a reader, enriched by theoretical problematizations of them. This essay can represent a model of the description of all of the emotions and properties of the reading process that Ingarden defined as undeserving of attention. Two years later, an essay appeard by Głowiński, entitled “Świadectwa i style odbioru” (Testimonies and Styles of Reception), in which the scholar, while still using the tools of Structuralism, transgresses what were traditionally designated the boundaries of the problem by that theoretical school, by dealing no longer purely with the structure of the literary text, but also with possible ways of reading it. Finally, the latest installment in the trilogy occured in 1980, when the first edition (the result of many years of social research) of Michel de Certeau’s book The Practice of Everyday Life appeared; in it, de Certeau proves that theoretical and political models of the organization of the world cohere with the everyday life of “ordinary people” to a much lesser degree than might appear to be the case. Various systems of power (such as capital, politics, science, religion, as well as art and culture) try to take over particular areas of human activity, seeking to place the individual in the role of a consumer of an order imposed from above. It turns out, however, that the individual does not subordinate himself to such a power structure at all and, as a consumer, does not remain passive. In his everyday activities, he leaves his stamp on each of the discourses that limit him and creatively refashions the behavioural schemata that are imposed on him. An initial, indeed initiatory, experience: to read is to be elsewhere, where they are not, in another world; it is to constitute a secret scene, a place one can enter and leave when one wishes; to create dark corners into which no one can see within an existence subjected to technocratic transparency and that implacable light that, in Genet’s work, materializes the hell of social alienation. In this interpretation, a given expression is apt because the reader wants it to be. “[R]eaders are travellers; they move across lands belonging to someone else, like nomads poaching their way across fields they did not write,” de Certeau further writes. The objective properties of the text, if they exist at all, cease in this situation to have meaning. Contrary to what Ingarden writes, what matters is what the reader does with the work for his own use. And he can do whatever he wishes with it, because in this intimate relationship there is no place for anyone who could stop him from doing anything. Scholarly analyses of all kinds of linguistic creations are, according to de Certeau, limited to reflections on what is repeatable and susceptible to being formulated in easily classifiable schemata. We lack tools, however, that would allow us to study how these works function in concrete situations in which they are used in singular, one-time ways by users of the language. This is glaringly evident in the case of proverbs. Scholarship can very precisely define what proverbs are and what the rules of their generation are; it has very little to say, however, about in what circumstances and in what manner they are used. Like tools, proverbs (and other discourses) are marked by uses; they offer to analysis the imprints of acts or of processes of enunciation; they signify the operations whose object they have been, operations which are relative to situations and which can be thought of as the conjunctural modalizations of statements or of practices; more generally, they thus indicate a social historicity in which systems of representations or processes of fabrication no longer appear only as normative frameworks but also as tools manipulated by users. Barthes likewise observes that each person has his own way of understanding the world, but that understanding can only be expressed using fragments of language which cannot be put together in a clear sentence. Perhaps the encounter with an apt expression is such an intense experience because the expression manages to approach the imaginative grasp, carried around by the reader but never given conscious expression by him, of the world’s essence. Thus if Ingarden spoke of the aesthetic experience, this type of encounter with an apt expression should be termed aesthetic shock. That would mean an experience that has less lofty significance for the knowledge of a literary work, but one marked by great intensity and which therefore allows the work to exert a powerful effect on the reader. 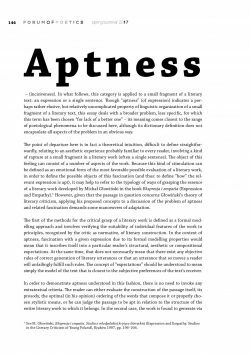 The question raised in this essay of whether aptness is a property of the text or of its reading has now been neutralized. We can clearly see that in various cases it may be a property of both. There is a rich catalogue of normative poetological criteria that justify the reclamation of certain approaches to the organization of literary texts and rejection of others, and perhaps an even richer array of experiences that the reader experiences in an intimate encounter with the text. In the first case, the aptness of expression can be submitted to analysis using all of the tools developed by literary theory. In the second, however, it can only be submitted to description – one can present a testimonial to it, as Barthes did, but not a justification for it. This entry attempts to explain what the mechanisms that govern the experience, familiar to every reader of literary works, of a particular aesthetic frisson elicited by a small passage in a work or even a single sentence. After presenting a handful of very general ways of understanding the category of aptness, the author moves to consider the subject of the possible shades of meaning it can take on depending on whether we treat it as an immanent trait of a given literary utterance or as a quality that takes form only during the process of the work’s reception. See M. Głowiński, Ekspresja i empatia. Studia o młodpolskiej krytyce literackiej (Expression and Empathy. Studies in the Literary Criticism of Young Poland), Kraków 1997, pp. 196–204. See Aristotle, Rhetoric, trans. W. Rhys Roberts, e-book, New York 2016..
 See Aristotle, Poetics, trans S. H. Butcher, section 145b, London 1902. Słownik literatury staropolskiej: (średniowiecze – renesans – barok)[Medieval-Renaissance-Baroque], ed. T. Michałowska, B. Otwinowska, E. Sarnowska-Temeriusz, Wrocław-Warszawa-Kraków 1990, p. 390. B. Eichenbaum, “How ‘The Overcoat’ Is Made,” trans. Robert A. Maguire, in Gogol from the Twentieth Century: Eleven Essays, ed. and trans. Maguire, Princeton 1974, pp. 267–292. R. Ingarden, O dziele literackim. Badania z pogranicza ontologii, teorii języka i filozofii literatury, trans. M. Turowicz, Warszawa 1960, p. 415. See R. Ingarden, O poznawaniu dzieła literackiego, trans. D. Gierulanka, Warszawa 1976, pp. 171–209. M. Głowiński, “Świadectwa i style odbioru,” Teksty: teoria literatury, krytyka, interpretacja (Texts: Literary Theory, Criticism, Interpretation) 1975, no. 3, p. 21. M. de Certeau, The Practice of Everyday Life, trans. Steven Rendall, Berkeley 1984, p. 173 (emphasis in original). Ibid., p. 21 (emphasis in original). See R. Barthes, The Pleasure of the Text, trans. Richard Howard, New York 1975, pp. 49–51.